The 2018 edition of the Jacobs Media Techsurvey shows a survey snapshot for consuming audio and radio, derived from American and Canadian radio listeners. 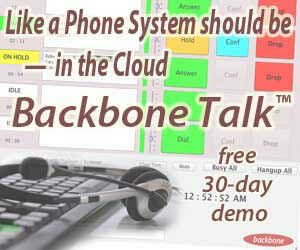 More than 64,000 listeners and 567 radio stations in the U.S. and Canada participated in the online survey. 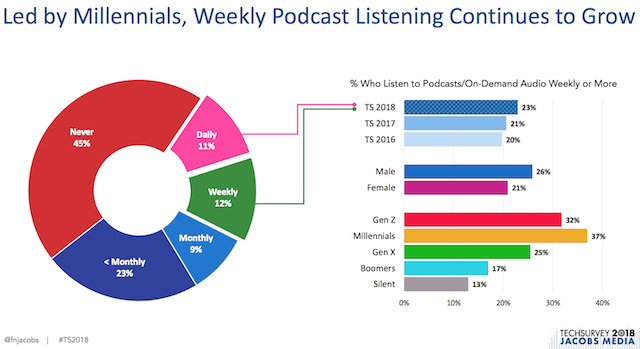 The reach of AM/FM radio remained strong in these results, and the latest annual survey showed growth for podcasting and smart speakers. The annual Techsurvey enlists radio stations to offer the survey to their listeners; accordingly, the resulting pool of respondents is comprised of AM/FM listeners, with what might be assumed as a slant toward p1 loyalty. U.S. and Canadian listeners are involved; Jacobs Media told RAIN News that the Canadian makeup for 2018 was about 9% of the total sample. 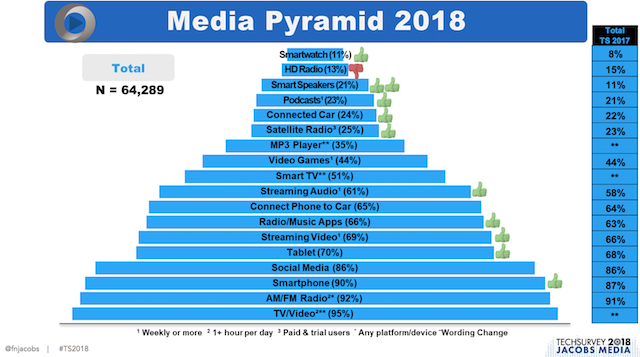 AM/FM had one of the largest slices of the media pyramid (second only to TV/Video), with 92% of respondents reporting at least an hour of listening a day, edging up from 91% in 2017. When asked why they choose to tune in to AM/FM, ease of listening in cars was the leading response at 69%. Hearing favorite songs/artists and free access each secured 60% of the answers. The specific hosts, DJs, or shows took a 58% share. Respondents who said they listen to less AM/FM radio were asked for the main reasons behind the change. Too many commercials was the top reason at 39%, followed by repetitive music at 36% and lifestyle changes at 34%. A third (33%) said that the reason was spending more time listening to Pandora, Spotify, or other streaming services. 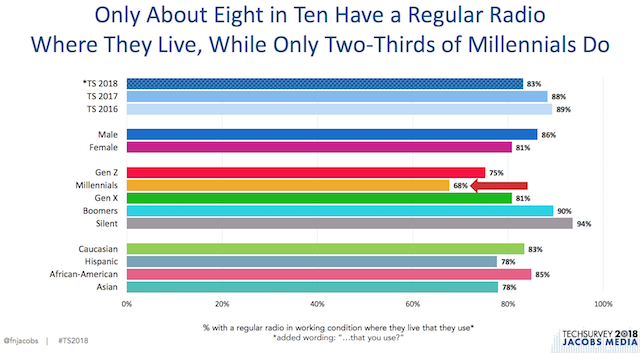 About eight in ten (83%) of respondents said they had a functioning radio that they use. The rate is lower than the 88% reported in 2017 and the 89% from 2016. Men were more likely than women to say yes. Millennials had the lowest rate by age group at 68%, followed by Gen Z respondents at 75%. The survey also asked about podcasts. 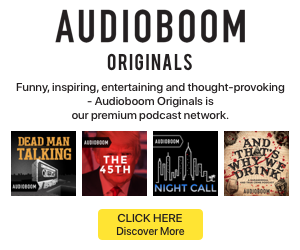 A large chunk, 45% said they never listen to podcasts or on-demand audio. Daily listening had an 11% rate and weekly listening had 12%. Monthly listening was 9%, and the remaining 23% listen less than once a month. Millennials are driving this form of consumption, with 37% listening at least weekly. Gen Z followed with 32%. Across the weekly listening group, 74% listen regularly on their smartphones, while 9% said they regularly tune in via smart speakers. 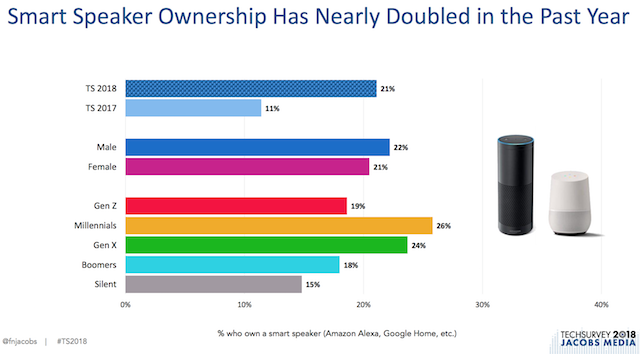 Smart speaker ownership skyrocketed from 11% reported in 2017 to 21% in 2018. Of the respondents who have the devices at home, an impressive 42% said they own two or more. Amazon Alexa led the pack, with 75% saying they only have a device with that voice system; 19% said they only had Google Home and 6% had both. A quarter (26%) said they listen to AM/FM radio on their speakers. The most common uses were asking general questions (36%) and hearing weather updates (32%). Listening to Pandora had a 17% rate and listening to Spotify had 10%. Why is it always the pundits of broadcast radio that tell us how well it’s doing. I’m a middle aged American/Swede, I know lots of people, none of them listen to broadcast radio. The curve is cresting soon, streaming will eclipse broadcast in a heartbeat in the next few years. But keep your head in the sand Entercom et al.